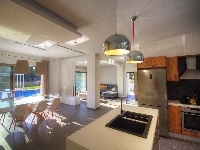 VILLAS AND APARTMENTS TO RENT IN CRETE, GREECE. 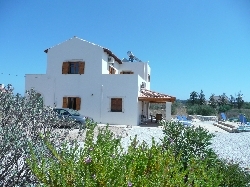 Welcome to our selection of holiday homes to rent in Crete, Greece. Crete is the largest of the Greek Islands, and one of the most diverse. It is comprised of huge mountains, sprawling coastlines with soft, golden sands with rocky outcrops and hidden caves and coves, alongside the Mediterranean Sea. Due to its large history it has a distinct look, with Venetian Castles and attractions that date back to the Minoan Civilization, such as the fascinating Palace of Knossos. With several mountains there are plenty of amazing vistas to see, adding themselves a unique look with the way they form a continuous chain across the island. Surrounding Crete are several small islands such as Gavdos and Dia, which ferries frequently travel to and from making for an interesting day out. Due to Crete�s lovely climate, fresh fruit is always available. With their Vineyards they make their own special wines, not available anywhere else in the world. With such a diverse island there is plenty to do, whether alone or with family, to add to your experience. From fishing trips, to hiking one of several mountains or visiting the zoo. Just walking through the land and seeing the Gorges and many hidden lakes can offer you a truly unforgettable experience, seeing the many villages, castles and ruins scattered throughout the island. With the many marinas and ports available, ferries are always available for day trips to some of the smaller islands nearby, some populated, others unpopulated and fairly untouched. For families there is the Limnoupolis waterpark, zoos and Crete aquarium. For adults Night Cruises are available, with various forms of entertainment on board. If you're up for travelling, there are many things to see whilst out, whether climbing up on of the many mountains and seeing the fantastic views it offers or visiting the Mountaineering and Skiing club of Iraklio. If you can get there early to avoid the crowds, the Samaria Gorge is a popular place to visit, with its wild flowers and resident mountain goats living along the ten mile long gorge, thought to be Europe�s longest. With the many hills and mountains, mountain biking is fairly common and could offer a nice day out. Crete�s beaches have a lot to offer to, with various watersports being readily available. Whether pedal boat, canoes and kayaks, jet skiing, wind surfing and even parasailing. There are glass bottom boats and cruises available as tours from many of the marinas. On the eastern side of Crete there is a palm tree beach, whilst heading south will offer many more caves and coves. One place to visit would be Knossos, thought to be the labyrinth with the Minotaur that was slain by Anthenian hero Theseus. Scuba Diving is also quite popular, as there are groups to tour with to see the famous Sunken City of Olous, with many new things being found each day. You could also visit the Crete aquarium, being of the biggest of its kind, housing sharks and small, colourful creatures. The Matala Caves is unique, lying to the south of Phaestos, having many man made caves carved into the cliffs. The caves, carved in almost two thousand years ago to be Roman Tombs, still remain today with dozens of them covering the sandstone cliffs. Most ancient ruins on Crete are Minoan in origin, Ancient Lato is one of the few that aren't. Established in seventh century BC by the Dorians, Lato was on of the biggest and most influential cities in its time. Although it now lies in ruin, it still has the governing pyrataneion building, a theatre and various mosaics along with the Temple of Apollo. It offers an amazing view across the Gulf of Mirabello. From the Ancient City of Aptera to the Koules Venetian Fortress or lounging on the golden, soft sandy beaches, you will be sure to experience something unique in Crete. Looking for self catering holiday accommodation in Crete? Then below is a selection of apartments in Crete and villas in Crete that can be rented direct from their owners. You can either click on each listing for further details or you can use our search engine on the left if you are looking for something in particular. Knossos, once the Minoan capital of Crete, is one of the most popular tourist attractions. Thought to be home to the Labyrinth of legend, were Anthenian hero Theseus slayed the Minotaur that lurked and hunted there, is still standing in places today. Within Knossos are the remains of a palace complex, with highlights being the Corridor of the Procession Fresco, the Theatral Arena, the Throne Room, the Hall of the Double Axes and the Western Court. Ancient Lato is one of the few ruins in Crete that isn't of Minoan origins. Created by the Dorians in seventh century BC, Lato is one of the largest and influential cities of its time in Crete and still well preserved in places. Mosaics still remain, along with the governing Prytaneion Building, a theatre and the Temple of Apollo are to be seen, as well as an amazing view across the Bay of Mirabello. These man made caves were carved out of sandstone cliff nearly two thousand years ago as Roman Tombs and still remain today. Dozens of the tombs cover the span of the sandstone cliffs, offering a very unique sight to see. The Ancient City of Aptera is sitting perfectly, with an amazing view in all directions. The Cretan Sea, the Akrotiri, the Valley of Apokoronou, the high White Mountains and Malaxa can all be seen. Even now as its in ruins, the size of the city is immense, with a lot of it still somewhat standing. Crete has a lot of wonderful beaches and a lot of things to do there. You're able to use/rent pedal boats, canoes and kayaks, jet skiing, wind surfing and even parasailing. Scuba Diving is also available, with several diving centres going out regularly. They take you to the most popular areas that have been discovered, such as the sunken city of Olous, and often find new areas too. CretAquarium is one of the largest Aquariums of its kind, housing hundreds of species and thousands of living organisms. Not only is it great, but educational and perfect for families to visit. There are three main airports in Crete, a small one located in Sitia with two larger ones; Nikos Kazantzakis located in Heraklion and Daskalogiannis in Chania. Crete sits between to different climate zones, the Mediterranean and the North African, but more in the former. During the summer the average is around high 20/early 30 degrees Celsius, with it spiking up to around 40. As it sits so close to the North African climate zones it has more sunny days and high temperatures all year round. Crete is the largest of the Greek island and the fifth largest in the Mediterranean Sea. It is located in the southern part of the Aegean Sea, separating the Aegean from the Libyan Sea, south of mainland Greece.